Click here to sponsor, register, purchase a tribute or donate! Join Visions Young Leadership of ISRAEL CANCER RESEARCH FUND to Spin for a Cure! The event will start at 6pm at SPiN, 344 State Street, Chicago. Your ticket includes 2 drink tickets, 2 hours of ping pong, and delicious hot appetizers. ICRF Visions Young Leadership presents its 3rd annual “Revolving Tables”, a social and networking event for a cause to be held at the Ivy Room in Chicago. 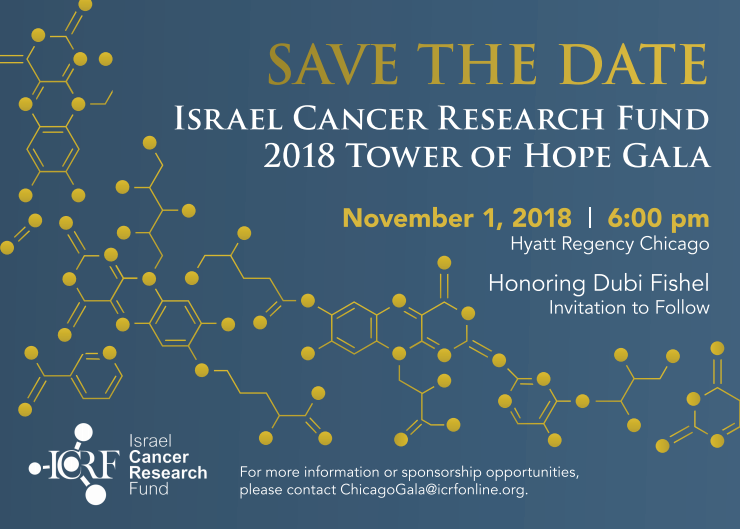 Hosting approximately 150+ young professionals, the event aims to raise awareness and funds for Israel Cancer Research Fund, while providing an evening of great food, professional growth, and social exchange. Throughout the cocktails and 3-course meal, participants will have the opportunity to meet other young professionals and engage with prominent executives and community leaders. At each course the young professionals rotate tables, offering a new and exclusive opportunity to interact with professional mentors, trendsetters, and industry leaders. For more information, please contact Sandy Rosen at sandy.rosen@icrfonline.org. Cocktails: 6:00 p.m., Dinner: 7:00 p.m.
For more information, go to the Revolving Tables homepage by clicking here. Tickets: $30 ($36 at the door) Don't miss out! It will be even more fun with friends so share with a friend and SIGN UP TODAY! Learn about Dr Asher-Fabian's exciting research on how thyroid activity impacts cancer. Hear her personal story about how she became invested in finding cures and treatments for difficult to treat cancers. Dr. Osnat Ashur--Fabian's research explores the relationship between the thyroid gland and cancer growth. Her story of how her personal and professional life came together is quite compelling and the Chicago Chapter of Israel Cancer Research Fund is thrilled to be hosting her on July 15th. Within ICRF, Rachel's Society focuses on women's cancer awareness and research. When you become a member of Rachel's Society, our ICRF-funded scientists are better able to continue their promising cancer research. We invite you to join Rachel's Society to connect with peers who have dedicated themselves to finding a cure through ICRF. Members attend annual lectures where prominent oncologists, including ICRF-funded scientists speak about the newest development in women's cancers. Memberships for the Rachel's Society are priced in several tiers. Revolving Tables is a professional networking event for a cause. Throughout the reception and 3-course meal, participants will have the opportunity to switch tables, meet other young professionals and engage with renowned CEOs and Executives. Each course will be a new, thirty minute experience providing an exclusive opportunity to interact with professional mentors, trendsetters, and industry leaders. During the registration process you will select the top 5 mentors you want to sit with. We will do our very best to accommodate your mentor selections. After each 30 minute course, you will move to a new table featuring a new mentor. Three courses means three different mentors! Make sure you reserve your spot at the exclusive $90 early-bird rate before they sell out. Feel free to invite your fellow young professional peers as well. All proceeds support groundbreaking cancer research by the Israel Cancer Research Fund (ICRF), which has created life saving and extending treatments for multiple myeloma, leukemia, ovarian, breast and AIDs-related cancers. Be guaranteed 3 of your top 5 mentor selections by registering early! Early Bird registration until March 26, 2015! OR RSVP FOR THE ROOFTOP PARTY! Want to make an impact this year? Do you know someone who has been impacted by cancer? Are you interested in creating & shaping a young leadership chapter for an organization whose goal is to cure cancer? Be a part of the first Chicago ICRF Visions Chapter meeting where we will learn about cutting edge research taking place in Israel direct from the source, with a video conference with Dr. Carmit Levy of Tel Aviv University. Dr. Carmit Levy (department of Human Molecular Genetics and Biochemistry at Tel Aviv University is working on promising approaches to prevention, diagnosis, and treatment of malignant melanoma. Born in Jerusalem, Levy established her lab at Tel Aviv University in 2011 after completing post-doctoral studies at Harvard Medical School in Boston. She began her academic career at the Hebrew University in Jerusalem, where she received a B.A. in biology, followed by a M.Sc in pharmacology and a PhD in Biochemistry.